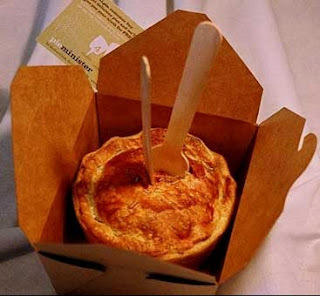 continue reading "Pieminister hits the shops"
Here are the Pierate Ship we are thrilled that one of our followers has already drawn our attention to a pie-related news story. With your continued lookout we can be sure that no thrilling pie news goes under our radar (or out of view of our telescope up in the Crows Nest). Yes, this is the news that one of Britain's favourite pie manufacturers, Pukka Pies, will be sponsoring the 2009 UK Snooker Championships which takes place in December. We're slightly baffled by the link between pies and snooker, though we can be sure that with such a large television exposure there will be a huge "cue" at the chip shops! continue reading "Snooker Championships get Pukka deal!" Welcome Aboard the bountiful Pierate Ship me hearties! 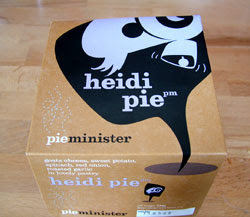 If you're as much a fan of pies as I am, then you're sure to love this site. Here at the Pierate Ship we have a curious obsession with eating pies and then rating them according to certain criteria. If you want to be an expert Pierateer then you'd better get clued up on how to sail the Seven Cs! continue reading "Sailing the Seven Cs"